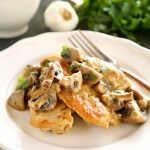 This One Pan Chicken with White Wine Mushroom Sauce is a super delicious restaurant-quality main dish that's so easy to make in only one pan! Slice the chicken breasts in half horizontally (butterfly them) to create 8 thin chicken pieces. Add the chicken pieces to the hot pan and brown them on both sides for about 3-4 minutes per side. If they don't cook through completely it's ok, they'll finish cooking later. Add the olive oil, garlic and onion to the pan and cook on medium heat until the onion becomes soft. Add the white wine, salt and pepper, and thyme and cook until the wine reduces. Add the mushrooms and sauté until they're soft and release their juices. Remove the mushroom mixture to another plate and set aside. Add the butter to the pan over medium-low heat and when it's melted add the flour. Whisk the butter and flour together and cook for one minute. Whisk in the salt and pepper and slowly add the white wine, whisking constantly. Add the broth in slowly and continue whisking until a smooth, thin sauce forms. Continue cooking over medium-low heat whisking regularly until the sauce begins to thicken. Reduce the heat to medium and whisk in the heavy cream. Nestle the chicken pieces into the sauce and add the mushrooms to the pan as well, stirring slightly to make sure everything is coated in the sauce. Add a lid to the pan and continue cooking the chicken in the sauce for about 5 minutes, or until the chicken is cooked through to 165 degrees Fahrenheit (use an instant read meat thermometer to test the doneness). Serve the chicken with a generous ladle of the mushroom sauce and whatever side dishes you prefer.